Pokemon Red Version is not a particularly obscure video game. Actually, it was a fairly popular one. First of all, it was played on the original Game Boy. Yes, it was enhanced for Game Boy Color, but you could even play it on the old black-and-white Game Boy. 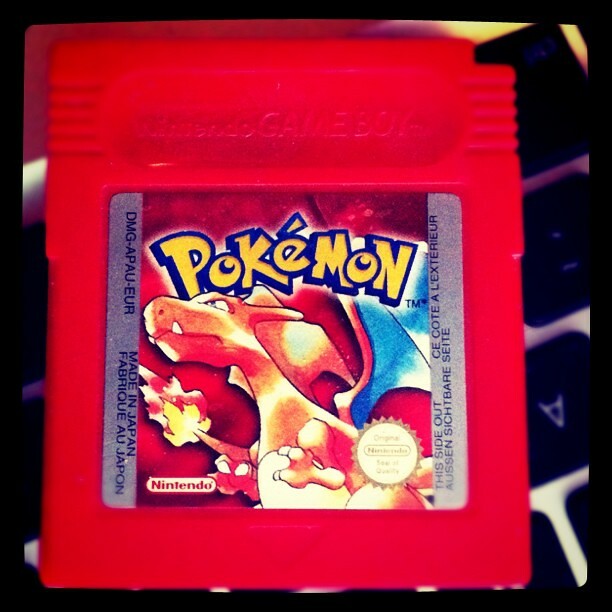 Plenty of digital ink has been spilled about Pokemon Red, its counterpart, Pokemon Blue, and its many successors. So what do I have to add? One thing that I rarely see written about is people discussing exactly why they got so into Pokemon. I'll tell you my reason, and it was incredibly simple: I love collecting things. It's seriously that simple. It wasn't so much about the training - which I admit I got into later, by Diamond and Pearl! I just loved discovering all of the different Pokemon and being able to capture them and subsequently be able to teach them abilities and have them fight for me was just mindbogglingly awesome. This certainly isn't an uncommon reason for falling in love with the game, but I think the collection aspect is far more overlooked today than the actual training and competition of said trained Pokemon against other Pokemon fanatics. People today talk about EV training and all of the different move sets and Pokemon natures, and what not. I've never cared about that stuff. Sure, I've paid far more attention to it in Black and White. But it's not a priority for me. To be honest, I'd rather kick back and play the original games. I know this has been written about before, but I would like to point out the reason that I've suddenly become so sick and tired of the series. I love Pokemon, don't get me wrong. I'll never stop being a fan. But, come on, how many more generations do there need to be? I believe that Pokemon should have an MMORPG. I seriously do. I'm most certainly not alone in that belief. (Pokemon GO is about as close as they've come to that.) Of course, Nintendo can make far more money by essentially creating new versions of the game to sell handheld and tabletop consoles. The 3DS was really selling on the strength of the Pokemon Mystery Dungeon game and the October 2013 release of X and Y.
Pokemon Red and Blue are just classic. I love playing them simply because of how familiar they are. The nostalgic value of those games is ridiculously high. Also, most of people's favorite all-time Pokemon are still among the first 151! What's not to love about the original games? The Dictate cycle is definitely quite fascinating. It's a cycle of Enchantments that bring an old, powerful effect from Magic’s history, increase its mana cost a bit, and give it Flash. In this case, this card is much like Heartbeat of Spring from Champions of Kamigawa, except that Enchantment cost only 2G, whereas this costs 3GG. There have been other enchantments with a similar effect, but with drawbacks. These include Winter’s Night from Alliances and Overabundance from Invasion. Zhur-Taa Ancient, a creature from Dragon’s Maze, also happens to have that effect, and it’s a 7/5 for 3RG. So does giving this card Flash suddenly make it a bunch better? Interestingly enough, this card works best with Kruphix, God of Horizons, and not Karametra, God of Harvests. Since the effect works for all players, Kruphix’s ability to turn any excess mana into colorless mana is really good. Five mana is a bit much for an enchantment like this, though. It is more stomach-able if you’re playing a Kruphix deck in which you’re using leftover colorless mana and only paying 2 Green for it. That’s something I’m sure R&D took into consideration in costing this card, as Heartbeat of Spring with Flash could've proven to be pretty powerful. While it's a bit expensive to cast in Standard, it's going to see some Commander play, certainly. It's especially good alongside Kruphix, for a bit of extra redundancy along with the cards mentioned earlier. It's important to note that this effect does stack upon multiple instances. It’s definitely a usable enchantment, and using the Flash to cast it at instant speed can help you take advantage of it first.